The Brigade Commander, 23rd Amour Brigade, Yola, Brig.-Gen. Bello Mohammed, says 11 suspects have been arrested in connection with a missing soldier in Opallo Village, Lamurde Local Government area, Adamawa. Mohammed told newsmen on Thursday in Yola that a District Head was among the suspects arrested. “The district head, name withheld, has been released on the request of Chief of Bachama Chiefdom, Honest Irimiya, with a pledge that he will fish out and bring those involved in the crime,” he said. Mohammed said a military search team was already working in the area to trace the missing soldier. Meanwhile, people are fleeing Opallo village for fear of possible arrest. 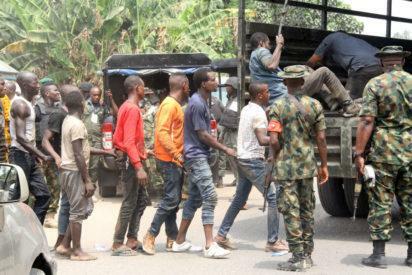 The post Missing soldier: Army arrests 11 suspects in Adamawa appeared first on Vanguard News.